These tunnels are activated by a timed motion sensor and automatically shut off if the line stops. 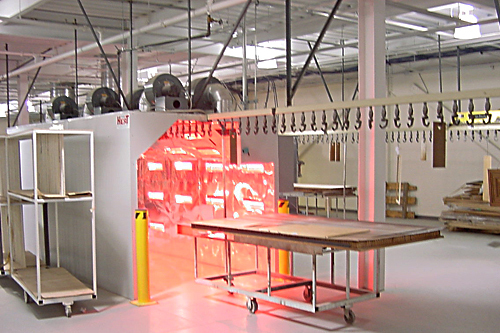 They have multiple heat zones each controlled by IR sensors with lasers that continually monitor your parts. This allows you to ramp up temperatures and operate in different wave lengths based on the coating. 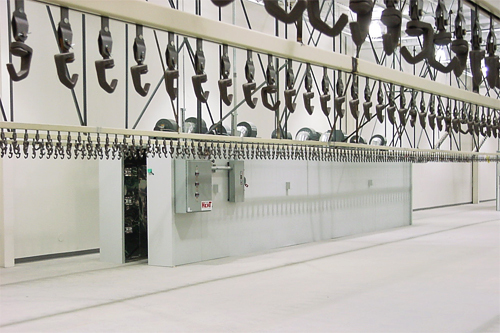 Heated air is circulated throughout the tunnel and is directly over the hanging part to create an air curtain around it. All halogen heat and heated air are controlled by the PLC’s 5” touch screen. All interior walls use highly reflective anodized aluminum which reflects the halogen heat back to your hanging part. System size is based on line speed and the type of coating being used. Heat is precisely controlled with the use of digital thermostats and IR sensors that hold part temperature to plus or minus 2 degrees Fahrenheit. This precise heat regulation and the use of high volume blowers circulating internal air over the product result in the fast cure times our systems achieve. 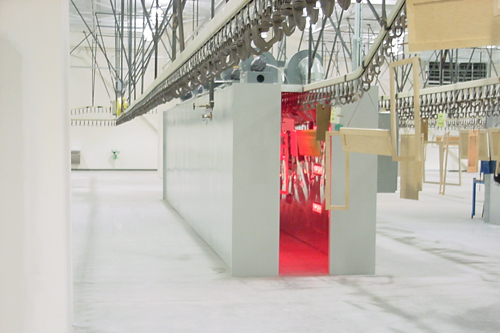 A two stage heat flashoff lets you place your product immediately into the oven to start the controlled cure process.